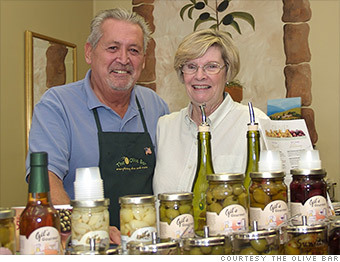 Ed DeSoto and his wife, Chrystie, opened The Olive Bar store in Campbell, Calif. in 2007. Six months after Ed DeSoto retired, he had a a stark realization: "I had mastered the TV remote control," he said. But, "I couldn't be like this any more. I needed to be in contact with people," he said. So in 2007, DeSoto and his wife opened a specialty store that sells a variety of premium olive oils, balsamic vinegars and coconut oil. "I've always been a salesman," he said. "I've never owned my own business before but everything fell right into place." DeSoto said he enjoys the daily chitchat with his customers, and the challenge of growing his business. "It's hard work. But at my age I don't want to work too hard," he said. "I have to remember to take some time off, too."